El ministro de Educación, Cultura y Deporte, Iñigo Méndez de Vigo, junto con el presidente del Consejo Superior de Deportes, José Ramón Lete, han recibido esta mañana en la sede del Ministerio a la Secretaria General de la FIFA, Fatma Samoura, y al presidente de la Comisión Gestora de la RFEF, Juan Luis Larrea. 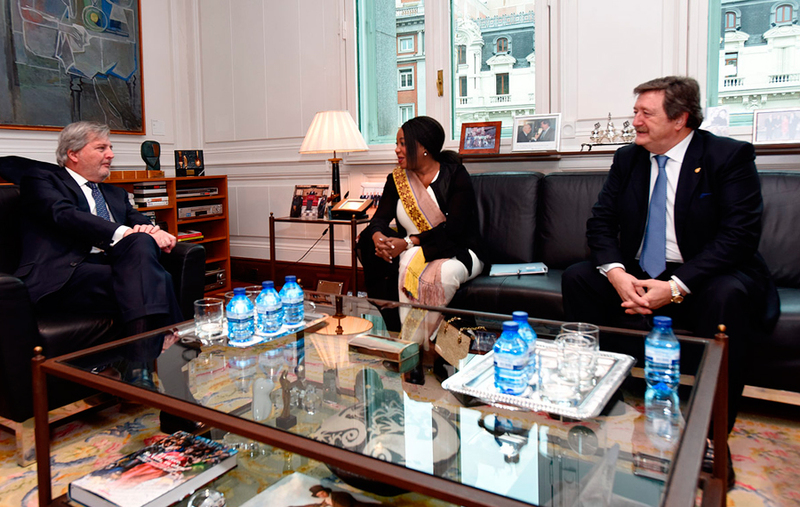 Minister of Education, Culture and Sports, Inigo Mendez de Vigo, along with the president of the Superior Council of Sports, José Ramón Lete, received this morning at the headquarters of the Ministry to the General Secretary of FIFA, Fatma Samoura, and Juan Luis Larrea. The meeting has taken place in a climate of full cooperation and it has addressed the current situation of the RFEF. Both delegations agreed on the need to be resolved as soon as possible through legal channels established the exceptional situation in which is the RFEF to safeguard the interest of Spanish football and respect for the rules, transparency and good governance . Attendees have also recognized the work done by the RFEF, which is guaranteeing complete normality in Spanish football.